The bond market has quickly priced in a Federal Reserve interest rate cut this year, just days after the Fed said it would stop raising rates. That has been a surprise to many investors, but it shouldn't be — if history is a guide. Joseph LaVorgna, Natixis' economist for the Americas, studied the last five tightening cycles and found there was an average of just 6.6 months from the Federal Reserve's last interest rate hike in a hiking cycle to its first rate cut. The economist points out, however, that the amount of time between hike and cut has been lengthening. "For example, there was only one month from the last tightening in August 1984 to the first easing in September 1984. This was followed by a four-month window succeeding the July 1989 increase in rates, a five-month gap after the February 1995 hike, an eight-month interlude from May 2000 to January 2001, and then a record 15- month span between June 2006 and September 2007," he wrote. The Fed last hiked interest rates by a quarter point in December. Last week, it confirmed a new dovish policy stance by eliminating two rate hikes from its forecast for this year. That would leave interest rates unchanged for the balance of the year, with the Fed expecting one more increase next year. But the fed funds futures market has quickly moved to price in a full fledged 25 basis point easing, or cut, for this year. "The market's saying it's going to happen in December," said LaVorgna. There are three conditions that need to be met for the Fed to reverse course and cut interest rates, LaVorgna said. First, the economy's bounce back after the first quarter slump would have to be weaker than expected, with growth just around potential. Secondly, there would have to be signs that inflation is either undershooting the Fed's 2 percent target or even decelerating. Finally, the Fed would have to see a tightening of financial conditions, with stock prices under pressure and credit spreads widening. LaVorgna said the condition of a sluggish economy could be met. "I don't think the economy did very well in the first quarter just based on the fact the momentum downshifted hard from Q4, sentiment was awful, production was soft," he said. 'I'm worried growth is close to zero in the first quarter." LaVorgna said he does not see much of a snap back in the second quarter. 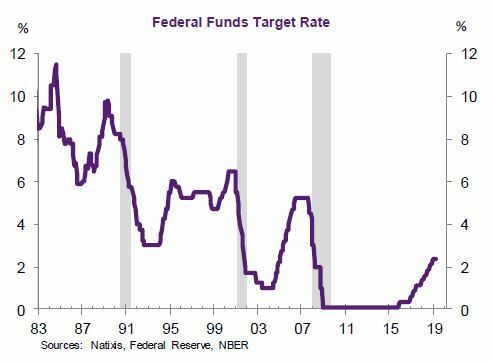 In the current cycle, the Federal Reserve began raising interest rates in December 2015 after taking the fed funds target rate to zero during the financial crisis.